Pain signals, once they are triggered, are thought to travel largely uninterrupted from the skin and other tissues into the spinal cord, where they are first filtered. But now, new findings from Nikita Gamper and colleagues at the University of Leeds, UK, and Hebei Medical University, Shijiazhuang, China, show that within the dorsal root ganglia (DRG), the neurotransmitter GABA can interfere with the propagation of pain signals. 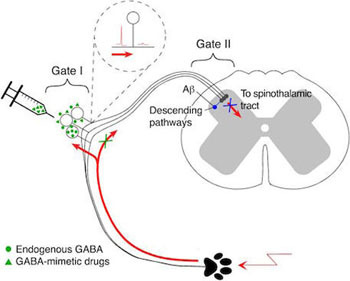 Delivery of GABA, GABA receptor agonists, or an inhibitor of the GABA transporter directly into the DRG of rats reduced pain-related behaviors triggered by injection of the inflammatory peptide bradykinin. Depolarizing DRG neurons using designer receptors exclusively activated by designer drugs (DREADDs) or optogenetics produced similar effects in mice. In contrast, blocking GABA receptors in the DRG of rats increased these behaviors. Researchers have long known that GABA is important in how the central nervous system processes pain. “This paper demonstrates a critical role for GABA in the peripheral nervous system” as well, said Ru-Rong Ji, Duke University, Durham, US, who was not involved in the study. “It adds another layer of complexity to the gate control theory,” which originally provided a model for how the spinal cord could “gate” pain signals. The findings were published April 4 in the Journal of Clinical Investigation. For decades, researchers have studied GABA receptors on sensory neuron cell bodies clustered in the DRG. During the 1970s and 1980s, for example, many studies took advantage of the relatively large cells to characterize the currents GABAA channels pass (Gallagher et al., 1978; Akaike et al., 1986). To determine whether there is a physiological role for these receptors, first author Xiaona Du, Hebei Medical University, and co-authors began by searching for a local source of GABA in the DRG. They co-cultured rat DRG neurons with human embryonic kidney 293 (HEK293) cells, which were transfected with GABAA receptor subunits. The authors then made electrophysiological recordings from the HEK293 cells. Upon applying capsaicin, an agonist of the transient receptor potential vanilloid type 1 (TRPV1) ion channel expressed by nociceptors, the researchers detected currents in 70 percent of HEK293 cells; these currents resembled those produced by GABA. This hinted that DRG neurons, and specifically nociceptors, can release GABA when stimulated. In support of that idea, using high-performance liquid chromatography (HPLC), the researchers found GABA in the extracellular space of cultured or freshly isolated DRG after depolarizing the cells with potassium, capsaicin, bradykinin, or adenosine triphosphate (ATP). Using reverse transcription polymerase chain reaction (RT-PCR), they also detected messenger RNA encoding various subunits of the GABAA and GABAB receptors; both isoforms of the enzyme glutamate decarboxylase (GAD65 and GAD67), which convert glutamate into GABA; the vesicular GABA transporter (VGAT); and all three plasma membrane GABA transporters (GAT1-3). That offered evidence that DRG cells possess the machinery to produce, package, respond to, and recycle the neurotransmitter. While GABA hyperpolarizes neurons in the central nervous system, it depolarizes neurons in the peripheral nervous system. How, then, would GABA signaling within the DRG affect pain transmission? To find out, the researchers infused GABA, the GABAA agonist muscimol, the GABAB agonist baclofen, the GABA transporter inhibitor NO711, or saline into rats’ DRG before the animals were injected with bradykinin in the ipsilateral hind paw. Compared to saline, each agent reduced pain-related behaviors, including licking, biting, and flinching. Consistently delivering both GABAA antagonists or a GABAB antagonist intensified those behaviors. “This behavior demonstrates that GABA in the DRG inhibits acute pain,” said Ji. He also praised the assay the researchers used, pointing out that “they tried to avoid GABA diffusing to other places, like the spinal cord.” They did so by implanting a cannula directly over the DRG, which delivered small amounts of each agent. A fluorescent dye, injected via the cannula, was used to estimate how far the drugs spread. The investigators also found that pain-related behaviors could be reduced by depolarizing putative GABA-releasing neurons of mice by using DREADD or optogenetic approaches. What’s more, targeting GABAergic signaling in the DRG had the same effect in the chronic constriction injury (CCI) model of neuropathic pain and the complete Freund’s adjuvant (CFA) model of inflammatory pain. In both cases, slowly delivering GABA, muscimol, or NO711 over the course of two weeks decreased mechanical and thermal sensitivity in the animals, compared to those that received saline. But if DRG neurons carry pain signals, then why do they use a neurotransmitter to inhibit those signals? Gamper suggests that GABA might filter out “noise” in the system—action potentials that, despite being generated, likely do not reflect actual danger. Indeed, rats that did not receive bradykinin nonetheless flinched and bit themselves when either of two GABAA antagonists was infused into the DRG, implying tonic GABA release from neurons there. As for how GABA can depolarize DRG neurons but still blunt pain, the researchers used a computational model to show that the cells’ shape might be important. In particular, they found that GABA-like depolarization could block the spread of an action potential at the site where sensory neuron axons bifurcate, called the T-junction. So, GABA stored and released by DRG neurons can stymie pain transmission, ultimately scaling down the amount of input to the spinal cord. To Gamper, the new set of findings fits with decades-old work showing neuron-to-neuron communication within the DRG (e.g., Amir and Devor, 1996). It also meshes with more recent work, such as research revealing “neuronal coupling” between adjacent mouse DRG neurons, and between DRG neurons and glial cells surrounding them, during inflammation or nerve injury (see PRF related news story). “There’s a whole range of mechanisms that allow a ganglion not only to be a factory that produces proteins, but an active component of the pain system,” said Gamper. In the decades since gate control theory was first proposed, researchers have mapped more and more of the complex spinal cord circuitry that determines whether or not pain information will reach the brain (Braz et al., 2014; see PRF related news story). “GABA signaling in the DRG would constitute an additional gate, or rather sort of a dial,” said Gamper. Local GABAergic signaling within sensory ganglia controls peripheral nociceptive transmission. J Clin Invest. 2017 May 01; 127(5):1741-1756. Cross-excitation in dorsal root ganglia of nerve-injured and intact rats. Chemically mediated cross-excitation in rat dorsal root ganglia. Characterization and ionic basis of GABA-induced depolarizations recorded in vitro from cat primary afferent neurones. 'Concentration-clamp' study of gamma-aminobutyric-acid-induced chloride current kinetics in frog sensory neurones.